Great Cities of Africa editions will include these cities. Since everything important starts at home, the village, town, city or community in which one lives, the Africa Travel Magazine editors believe that is where our exploration of this important, universal and timely topic should begin. Pride in one's community is paramount - and that's why, while attending a municipalities convention in the early 90s, we were so overwhelmed by the grass roots efforts of an organization known as Communities in Bloom. The idea was born in Canada and the originators have since shed their light to the USA. 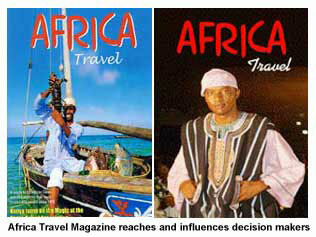 We believe it's Africa's turn - and our editor has championed the concept in Africa at the podium and media interviews. Below is a brief outline, plus link to their website. Other examples of Africa's Green Revolution at home, in the community, in the world of agriculture, horticulture, waste disposal, water purification and city beautification will follow. These topics will be part of our GreenBooks - inserts in issues such as Great Cities of Africa and the Cultural and Ecotourism Editions. Communities In Bloom is a Canadian beautification program that provides information and education, and awards Bloom Ratings for achievement in floral displays, landscapes, turf, urban forestry, community involvement, heritage conservation, environmental awareness and tidiness. This volunteer-based, nonprofit organization is committed to fostering civic pride, environmental responsibility and beautification through community participation and the challenge of national competition. Much more to come. Please send items.